Plot: A story of survival set 20,000 years ago during the last Ice Age. Starring: Kodi Smit-McPhee, Leonor Varela, Natassia Malthe, Johannes Haukur Johannesson. 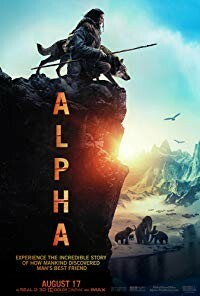 distributed by Columbia Pictures «Alpha» in the US movie theaters released on August 17, 2018 and has grossed over $79 million worldwide; dvd and blu-ray release date was set for November 13, 2018. Rent from Netflix and Redbox from November 13, 2018. «Alpha» in the UK released in movie theaters on August 24, 2018. The movie released on dvd and blu-ray on January 7, 2019.